Mission impossible; to run 6 inch in a 40min PB in about 4.50 and so finish before my Garmin ran out of battery life. Did I choose to accept it; yes but realistically it was never really likely to happen this time, so my backup $14 Big W watch was needed to get part 3 of my time. Too busy Saturday trying to get everything organised that night, so by 0150hrs Sunday morning I knew it was time to drive to Dwellingup even though I was already tired from getting up at 3am that morning. For about the 3rd time in 8x6 inch attempts (1 DNF last year) , it was going to be the "no-sleep" "all-nighter" routine. Less than ideal, but I'm used to it so well able to make a goer of it, although it does probably make PB attempts hard, and I pay for it big time on Sunday arvo... At the start caught up with a few of the stalwarts, and had plenty of time to relax, and this time got my toilet stop done and my drinks put in for the aid station (crucial with the hot weather forecast). Had a dream start and cruised alongside Brendon, Tom, Gerry, Scott, Kevin and others. near the Scarp Rd and the new Munda Biddi turnoff. Ran with Lucia and a few others, Mandy... Garmin ran out of battery life Walking lots due to very tired legs but going ok... Part 2; http://www.strava.com/activities/100263906/overview The grind to Aid station 2, and then the attack through to Marrinup aid station 3, and grind to the finish 8:38am on Sunday, December 15, 2013 6 inch trails part 3 garmin flat 35-40 degrees Hard firm trail jarring my soreish knee and heel a bit. walked for a K or so. Ran and chatted a bit with someone called Mandy who said she has done Comrades 6 times and that she prefers the UP run from Durban. That was interesting and I think we did both pick up our pace for awhile so maybe it was a positive move to run with someone for a few minutes... Saw a few people going past the other way that I know. Eventually I arrived at that horrible rotten rutted hill and my legs found it a real challenge to get up it. Stopped a few times here. Aid station 2 is an oasis!!!!!!!!! Ice in hat. throw 1.5L of water over my head. Mercury heading into the 35+ zone... Down the rotten hill high five a bunch of runners (all of whom later I find out missed the cutoff, as did Mandy who must have stayed at the aid station a bit longer than me. ) Bloke in blue shirt runs past me I catch him on a gravel hill about 3km later, pass him, takes ages to get to powerlines, fingers swell up due to heat stress. SOme woman with a TRC goes past me here. Later looking at results I think her name must have been Colette. Aid station 3 is a lifesaver!!!!!!!!! Cocacola, and water do the trick (tried some sports drink but it tasted horrible, so only down a mouthful or two of that) throw another 600ml of water over my head, have just 300ml of emergency water left. 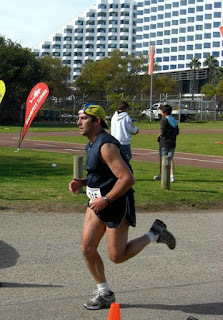 Bloke in blue shirt 500m behind me. Grind planetarium/tunnel vision in the zone time... resolve to limit walk breaks to 30secs... The Marrinup Maze seems to go on for ages, use last 300ml of water. Huge emotions at the finish I've done it with 5min to spare, in 7 hours 24min 39secs. Thanks to Ron McGlinn and Paul Harrison for the excellent!!!! photos. Yes, great photos Jonathon. Congrats on your 7th 6" finish. Brutal conditions. Thanks goodness for the 7:30 time limit. All the best to you and the family. Hope to see you in 2014 - most likely Gold Coast and Melbourne for me. Also Blackmores - great event, that one.